The BBC licensed LS5/9 and LS5/8 use a custom steel grille to protect the delicate tweeter diaphragm. 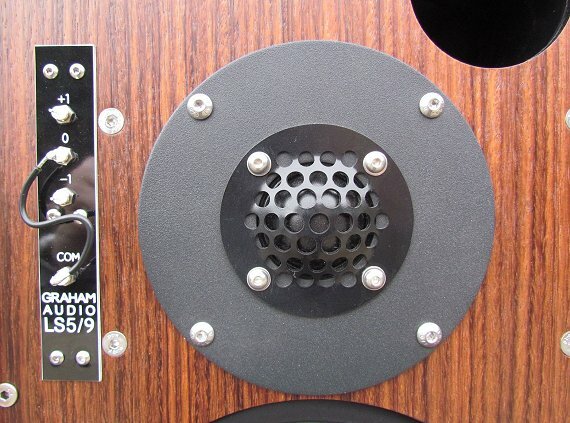 It is a substantial piece of metal that had to be carefully designed to avoid changing the frequency response of the tweeter, and has to be inherently well-damped so that it doesn't "ring" when the loudspeaker is in use. The BBC originally specified an off-the-shelf punched steel sheet, which was cut and pressed according to their specification. But while perfectly functional, the aesthetic results were less than ideal. After extensive investigation, we abandoned the generic punched sheet and created tooling for a custom pressing that has a smooth outer section. The result looks much better, and the new grilles are sonically equivalent to the original sheet material. All Graham Audio LS5/8 and LS5/9 loudspeakers will ship with this new grille from today.